A part of the same botanical family as onions, scallions and garlic, chives grow from small bulbs and have a long history of cullinary and medicinal uses. 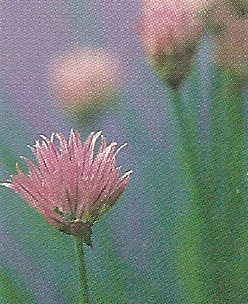 In the Middle Ages, chives were promoted as a cure for melancholy and believed to drive away evil spirits. 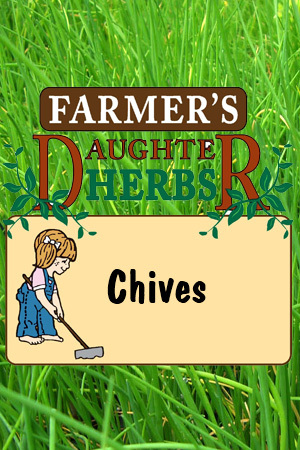 Today, we know that chives and chive flowers are high in vitamin C, folic acid and potassium. Therefore they should be routinely added to recipes to help restore vital nutrients lost in cooking. This herb's tangy, aromatic taste comes from it's high concentration of sulfur compounds and other essential oils, which are partly responsible for its healing properties. Chives ease stomach distress, protect against heart disease and stroke and may help the body fight bacteria that can cause disease. In addition, the herb may increase the body's ability to digest fat. An herb which resembles hollow blades of grass, chives are valued for their many essential minerals, including cardiac-friendly potassium, bone-strengthening calcium and blood building iron. 1. Blend the cottage cheese and mustard. 2. Peel the shallot, chop finely and mix with the cottage cheese blend. 3. 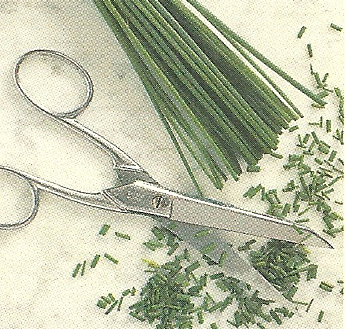 Wash and dry the chives and snip them finely. Stir about two-thirds of the chives into the cottage cheese mixture. 4. Season the cottage-cheese mixture with the paprika and add salt and pepper to taste. Sprinkle the remaining chives on top. 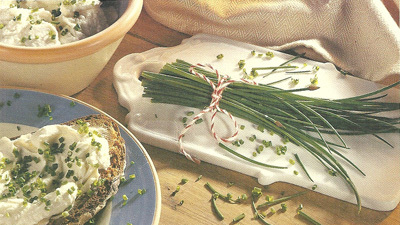 If you like the oniony flavor of chives, make your own chive salt to add zip to all sorts of dishes. First, add some chives to some salt. Then bake the mixture in the oven to dry the leaves and blend the flavors. Store in an airtight jar. Don't overlook the chive flowers. The chives delicate purple flowers have a milder flavor than the leaves and add a decorative touch to salads, herb oil, add 1-1/2 oz. of the blossoms to 1 quart of vegetable oil. After a week, the oil will turn lilac and take on the fragrance of the chive flowers. Use the oil on salads or in cooking - keep refrigerated when not in use.